Word is rapidly spreading that Ignatius Leong of Singapore has made a deal with Kirsan Ilyumzhinov and is about to withdraw as a candidate for FIDE President. Here is a picture I took of Ignatius Leong in 1988. Leong is seated to the far left. Standing is Grandmaster Eugenio Torre of the Philippines. Leong bid for Singapore to hold the Olympiad in one of those two years. However, just as his bid was gaining momentum and had chances for success, Leong backed out and withdrew his bid. 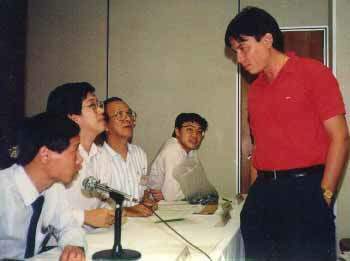 Later, since I, Sam Sloan, was continuing to circulate a petition among FIDE Delegates not to hold those two Olympiads in Greece but to hold at least one in Singapore instead, Leong went up on the dias, asked for the microphone and criticized me and disavowed the petition I was circulating, which by then had many signatures of FIDE delegates. Leong has done things like this many times since. For example, there was the 1996 FIDE Congress in Yerevan where Leong switched sides and then claimed that his life had been threatened. Leong later formed his "World Chess Organization", which flopped and disappeared. At the recent FIDE Congress in Istanbul, I asked Leong what had happened to his "World Chess Organization". Leong replied, "What World Chess Organization?" "Many of us would like to know ... especially as you indicate that you are going to ask the rest of the world to support Leong's Ticket ?? Have you looked at Ignatius's 'track-record' within FIDE ? I have ! I am beginning to think more and more that I should have done as many asked me - as far back as 6 years ago ... and that was to put up my own 'Ticket' this year ! I am confident that my ticket would have been a better one than either or the two we have !!!" However, this time there was hope that Leong might not flake out. Leong had assembled a distinguished group of chess personalities to run on his ticket. These included Morton Sand, a lawyer from Norway, Lin Feng of China, Jean-Claude Loubatiere, President of the French Chess Federation and Uvencio Blanco of Venezuela. Only Steve Doyle of the USA remained loyal to Kirsan Ilyumzhinov. One wonders: Did Morton Sand of Norway, Lin Feng of China, Jean-Claude Loubatiere of France and Uvencio Blanco of Venezuela know that Ignatius Leong has a history of being a flake when they agreed to join his ticket? Is it too late for these same four people assemble an alternate slate that does not include Leong to challenge for the FIDE Presidency?